Franco-Japonaise by the master himself, chef Kiyomi Mikuni. 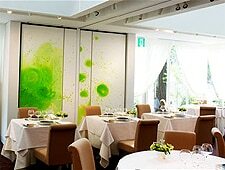 : Hotel de Mikuni is the flagship enterprise of Kiyomi Mikuni, one of Japan’s most famous chefs for French cooking. His restaurant, in a gracious old home in the middle of a quiet, middle-class neighborhood, is a short walk from the Imperial family’s residence and the state guest house. Mikuni has always set the standard for Franco-Japonaise cuisine---which is basically the end result of Japanese chefs adapting old-style classic French food to local tastes. So the cooking has subtler flavors, smaller portions, picture-pretty presentations and occasionally an Asian touch. At his restaurant, Mikuni makes truffle soup à la Paul Bocuse, but he also dusts foie gras with curry powder before frying, and serves a filet of striped pigfish with a risotto made of green peas and Japanese fish stock. One of Mikuni’s specialties is duck, and when he’s in the mood, his seasonal menu is filled with various incarnations of it. We’ve had roasted dark meat with a blood-red sauce that tasted of raisins and oranges, a tender roll of white breast meat in a clear duck consommé, and a dramatic production which he calls canard roti “sang-de-boeuf.” The latter is brought to the table in a special wagon, where it is masterfully carved and served with an array of condiments, to the delight of the diners concerned and to the envy of everyone else.